Want to give your desktop Linux a Chrome makeup? I’ve got a theme that might suit you. Chrome OS, a derivative of open source project Chromium OS, is a far-distant cousin of desktop Linux. It has grown somewhat popular recently. Chromebooks (devices preinstalled with Chrome OS) have outsold MacBooks in America. Many Linux users have liked Chromebooks for the facts that it is cheap, good-looking, lightweight and gives you access to command line (you’ll have to put some effort for the command line). In an earlier post, we have seen how to install Linux on Chromebook. But this post is not about Chromebooks. But this post is not about Chromebooks. This article is about a new theme that changes the look of your current desktop Linux environment to make it look like Chrome OS, or so it tries. Once downloaded, extract it to ~/.themes directory. In both the cases, you can use a tool like Unity Tweak Tool, GNOME Tweak Tool or the tools for your desktop environment to use the newly installed theme. 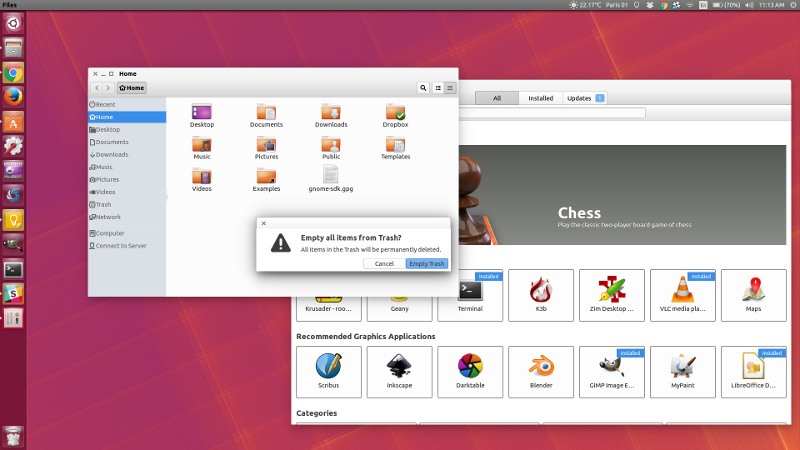 You can read this post to learn in detail how to change themes in Ubuntu Unity. Honestly, a theme is incomplete without a matching icon theme. As you can see, the theme doesn’t blend in properly. Of course, you can put more effort to make it actually look like Chrome OS (by installing matching icon theme, using bottom launcher etc), but I leave that to you. Since we are talking about Chrome OS, I would suggest you to check material design inspired Paper theme suite. It has both icons and GTK theme and it does change the entire look of the desktop pretty well. The icons are marvellous and they even made to the top spot of our list of best icon themes for Ubuntu 16.04.